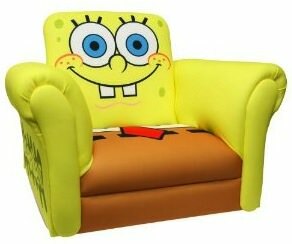 Kids deserve a nice chair to and this Spongebob chair could be the perfect chair for your kids. This chair looks like Spongebob Squarepants with big yellow parts and a brown sitting part and the back has Spongebob’s face on it. This Spongebob chair is a rocking chair so now when you kids are relaxing and reading a book they can rock back and forth while doing so. Kids will love this chair so maybe you should check out this Spongebob Squarepants Rocking Chair.